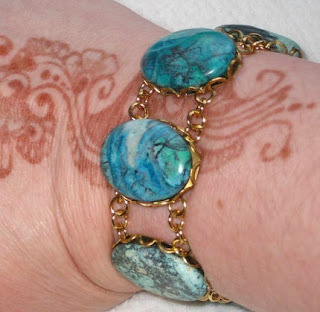 Christina is the owner of Icy Jewelry and she has graciously answered a few of my questions to get to know more about her and her work. I am currently on Maternity Leave as my second child was born on June 7th 2008. I am a mother of two- a Girl named Isis 3.5 years old and a boy Named Aristotle 9 months. When I am not on Maternity Leave, I am a Librarian working full time at time at a University Library. 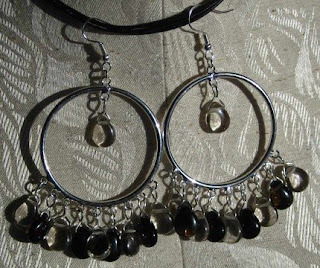 I love to make Jewelry, all kinds, I love to use unique beads and semi-precious stones. I love watching and reading Science Fiction and Mysteries and I absolutely love reality television, but I think it is getting out of hand now a days, my favourites are Survivor, Amazing Race, Apprentice, Big Brother. I took my shop name from my daughter Isis she was my inspiration. I have been making jewelry for over 20 years, but decided to start selling about 9 years ago, on my good friends urging. I began by only selling to brides and bridal parties, and making a few special pieces in between. I first heard about ETSY in January 2007 and I decided that I wanted to try something new. I now make and sell necklaces, earrings, bracelets, just about anything. What inspires me are my family, my children, the ocean, the trees, the sunshine, the snow, I basically guess nature and my surroundings. Lately I have been inspired by my reading. But I love bright colors. Spring and Summer are my favourite times. Who is your favourite Twilight character? My Favorite character is Edward of Course, but I also like Jacob, Emmet and Jasper. 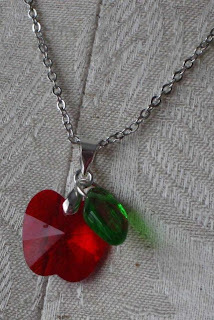 Christina of Icy Jewelry has offered my readers the chance to win a Bitten Twilight Inspired Crystal Apple Necklace. It’s an Austrian Crystal Apple shaped faceted pendant that measures just over 1/2 an inch and is paired with a beautiful deep green glass leaf bead.The necklace measures 18 inches. Makes a great Twilight Series Fan gift or makes a great gift for that teacher you love! Anyone want a free box of Banana Nut Cheerios?